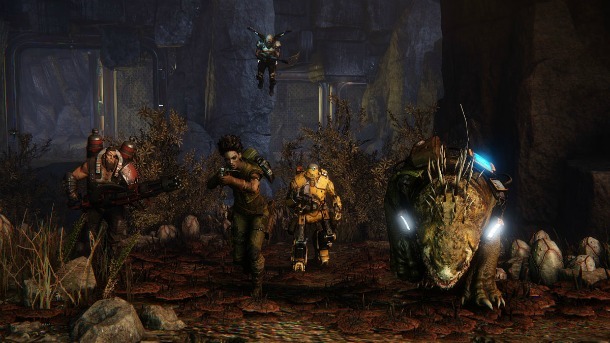 Some new information has been released about Turtle Rock Studio's new game, Evolve. A new trailer was released today that showed off some of the new characters that will be making an appearance in Evolve. Four new character details were released that were typically a spin-off from the original four that were previously shown in gameplay trailers. The new characters still run off of the original classes (trapper, medic, assault, support); however, their abilities are somewhat different. The concept of the game is that one player plays as a monster while four other players must hunt it down. As the monster kills, it can evolve and get stronger. So far, only one monster (known as "The Goliath") has been revealed, but Turtle Rock previously announced that there will be multiple selectable monsters. Maggie is our new trapper character. She is different from the previous trapper character, Griffin, because she has her companion, Daisy. Daisy is a trap-jaw, a dog-like creature that resembles a large reptilian monster (as seen in the picture above). Maggie is going to use Daisy to effectively hunt down the Goliath in the game. It has not been confirmed yet whether Daisy will actually attack the monster or just track him down. The previous trapper, Griffin, had to use items called sound spikes to track and find the monster whereas Maggie can actually follow the monsters' foot-prints. The foot-prints will be outlined in blue on the ground, but I'm not too sure whether this will be an activated ability or a permanent ability. Maggie also has a harpoon trap, which is a deployable turret-like item that can be placed on the ground. Lazarus is our new medic character. Lazarus, by far, is the biggest threat to the Goliath as he has the ability to reanimate the dead. So, if a player gets knocked down and killed, you could effectively bring him/her back into the fight instantly. However, this ability also has a bad side. The monster will try to single you out and take you out first because you are key to the team's successes. Hyde is our new assault character and is the ultimate tank out of the group. His weapons include a chain-gun and a flamethrower that are held on each arm, but cannot be fired at the same time. If you can master switching between the two weapons depending on the situation, you will destroy the monster. However, there is a bad side to the new weapons. You need to be close to the target to actually hit it, because the range on the weapons isn't fantastic. Hyde also has a toxic grenade that, when deployed, will emit a toxic gas that can be used to flush out the monster if used effectively. Bucket is our new support character. First off, Bucket is a robot, and this gives him some interesting abilities. Bucket can pull off his own head and use it as a controllable drone that can be used to find and lock-on to the monster so that the other players can see were it is in the area. Bucket also can deploy a turret that takes the form of a sphere-like drone and hovers off of the ground. Bucket is a lot more effective compared to the previous support character, Hank, because of his powerful rocket launcher. That's all the information that has been released so far about the new characters in Turtle Rock Studio's new game, Evolve. Check out the new trailer for some gameplay featuring some of the new abilities below!